The new Body-Solid Leverage Shoulder Press LVSP product features is commercially rated with heavy duty 2" x 3" 11 gauge steel construction with an electrostatically applied powder coat paint finish and durable double stitched upholstery. The multigrip ergonomic hand grips are perfect for the serious lifter looking for variety. Included for your convenience are four all new triple chromed weight storage holders. The Body-Solid Leverage Shoulder Press LVSP has been approved for commercial application in the following industries: corporate facilities, YMCA/JCC, military/government, police and fire departments, parks and recreation, high schools, universities/colleges, personal training studios, fitness centers, hotels & spas, multi-housing, rehab & medical, community service agencies and professional sports teams. Natural feel and resistance of free-weights with the control of a machine. 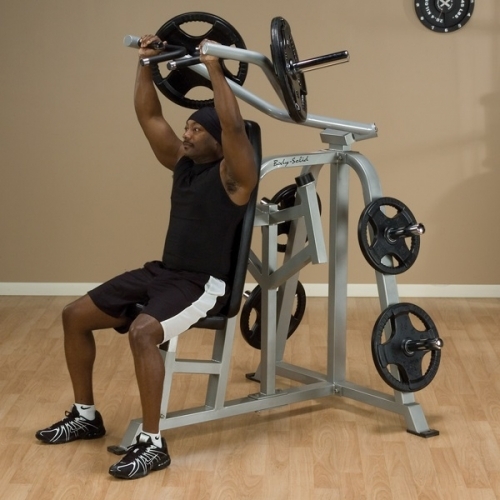 The Body-Solid Leverage Shoulder Press LVSP offers versatility and advanced safety features ensuring a complete heavy-duty workout without the need for a spotter. Load up the plates and go to work! 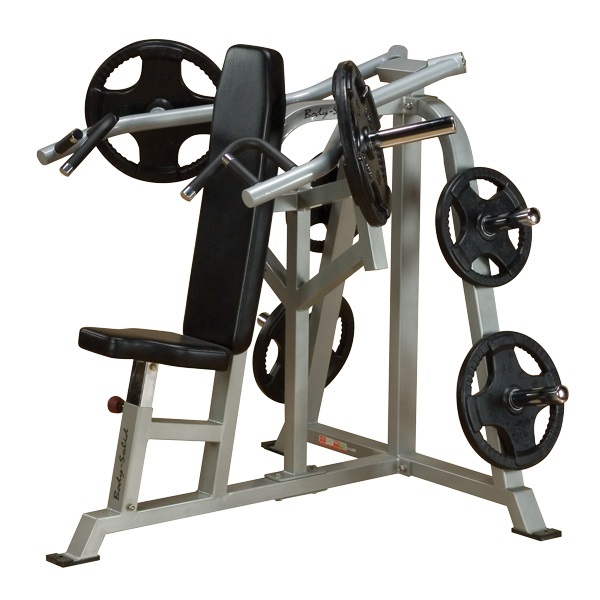 The Body-Solid Leverage Shoulder Press LVSP is designed to provide an intense workout while eliminating strain, the Body-Solid Leverage Shoulder Press LVSP is hard to beat. Easy and convenient step-in design makes getting started a breeze. The Body-Solid Leverage Shoulder Press LVSP thick, comfortable DuraFirm™ pads reduce fatigue and discomfort allowing you keep working out. Rock solid support and stability is delivered via heavy-gauge steel frames with all-4-side welded construction. Body-Solid is here to make sure you get the absolute most from your workout, the ability to push your limits, the room to excel.Body-Solid Leverage Shoulder Press LVSP is an industrial strength training partner that doesn't try to change how you workout, it works with you. The Body-Solid Leverage Shoulder Press LVSP is one of the best ways to work your Delts, Shoulder Rehab, Shoulders, Traps and Triceps in a safe and efficient manner. If you are looking to bulk up and build power, or simply to tone your muscles and increase performance, the Body-Solid Leverage Shoulder Press LVSP is definitely the foundation of the ultimate weight system. Call 1-800-875-9145 to chat with one of our fitness advisors with any questions you may have about the Body-Solid Leverage Shoulder Press LVSP . 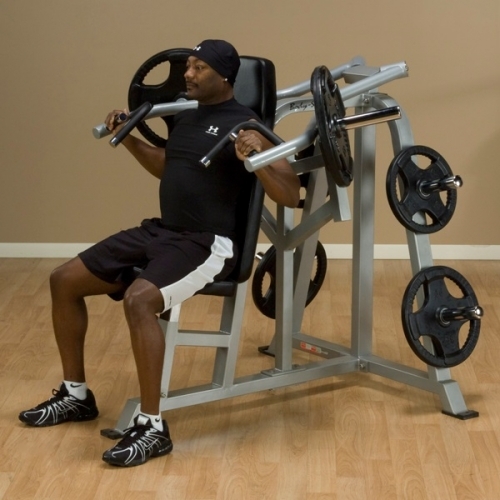 Order your Body-Solid Leverage Shoulder Press LVSP from FitnessZone today! 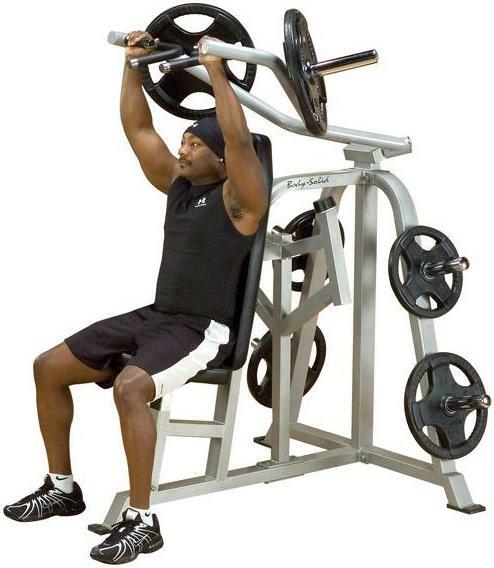 Order your Body-Solid Leverage Shoulder Press LVSP from FitnessZone.com today!